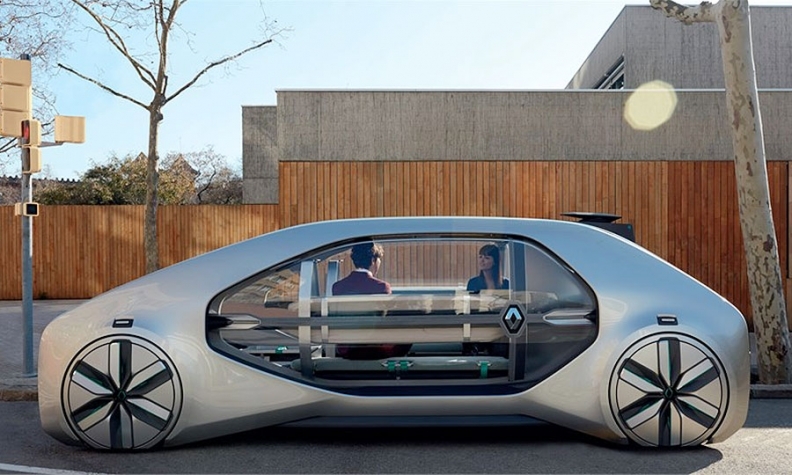 Renault has showcased its robotaxi plans with the EZ-GO concept. PARIS -- The French government is supporting the development of self-driving cars, with the aim of deploying “highly automated” vehicles on public roads between 2020 and 2022. France’s technology-minded president, Emmanuel Macron, appointed a senior official, Anne-Marie Idrac, to develop a national strategy for driverless mobility – including new laws, regulations for experiments and pilot projects, and cybersecurity and privacy issues. The first legal proposals are expected by the end of this year and once approved will allow Level 3 and Level 4 passenger vehicles, driverless mass transit such as robotaxis, and automated delivery vehicles. More than 50 autonomous-vehicle test projects have taken place in France since 2014, including robotaxis, buses and private vehicles. The government has made 40 million euros ($46 million) available to help subsidize new projects. The leading robotaxi developer is Nayva, a Lyon-based company that already has dozens of self-driving shuttles in pilot projects around the world and recently announced plans to open an assembly plant in Michigan. Small, driverless shuttle buses built by Nayva – which has financial backing from French supplier Valeo, among others – have been operating on closed road circuits in La Defense, the business zone outside Paris, since 2017. Among automakers, PSA Group has a partnership with NuTonomy, which creates self-driving software. Peugeot 3008 crossovers fitted with NuTonomy’s technology are circulating in a business district in Singapore. NuTonomy, a Massachusetts Institute of Technology spinoff, is now owned by Aptiv. Renault CEO Carlos Ghosn has promised that Renault and alliance partner Nissan will have a fleet of robotaxis on the roads by 2022. As part of that push, Renault showed the EZ-GO robotaxi concept at the Geneva auto show this year. Design director Laurens van den Acker said the EZ-GO was meant to be a stylish antidote to the “box on wheels” model of future urban mobility.